Going to an academic conference is an exciting opportunity to connect with like-minded individuals and exchange stimulating ideas. However, to make the most of a conference requires a lot of hard work before, during, and after the meeting itself. Marta Teperek provides a checklist of things to do at each of these stages. Hurray! You are going to that conference you were really hoping to attend. So now the hard work begins to ensure that you can make the most out of the meeting (and that your employer has no doubts that it was an excellent decision to send you there). Ideally, it is good to decide about attending a conference as early as possible. This usually allows one to contribute to the overall programme of the conference by suggesting a session topic or by proposing a workshop. Think about this carefully: is there a problem related to the conference theme that you are struggling to solve? Is it likely that this problem might be shared by more members of your community? If so, you are likely to have identified an interesting session proposal. If it is too late to propose a dedicated session, have a look at the call for papers and see where your work would best fit in. Presenting your work at a conference is always an excellent idea. No matter if it is preliminary or more advanced, you will always receive lots of feedback from other experts in the field. If the conference does not accept papers, or if the call for papers is closed, it still might not be too late. Be creative: have a look at the topics. Is there something that closely matches the work you are doing? If so, approach the organisers, tell them about your work and ask if it might be possible for you to present. Similarly, perhaps there is a workshop on a topic of your interest, where you could facilitate a session, or lead a breakout discussion? If your paper is accepted, you will need to prepare your talk. Do it well in advance, and ensure to ask your colleagues and people involved in your project for your feedback. Not only you will receive useful suggestions on how to improve your talk, but this might also create an opportunity to get more co-workers interested in your work. It might be a good idea to organise a meeting to practise your talk and to invite people to come along. This will allow you to precisely time your talk and to get feedback from the others on the clarity of your messages. Once your talk is ready and you are happy with the content, upload your slides to a suitable repository (for example, Zenodo). Uploading your slides into a repository not only allows you to get a DOI for your presentation and to track the mentions and citations of your work but, more importantly, allows others to reuse your slides. There is nothing more encouraging and rewarding than seeing one’s slides and ideas reused by others. Could one possibly receive a better sign of appreciation for one’s work? Sharing slides in a repository should be accompanied by a choice of an appropriate licence, to ensure that potential reusers know what can and what cannot be done with your slides. Once you have shared your presentation in a repository, add the DOI link to your presentation to the slide version you will be presenting at the conference. I like to mention that the slides are available online at the beginning and at the end of my slides. In addition, ensure that your contact details (including Twitter handles if you have a Twitter account) are provided – ideally also at the beginning and at the end of your presentation. Once you have the DOI to your presentation, the time comes to schedule tweets about your talk. Easy scheduling of tweet messages is possible with platforms such as Tweetdeck. Find out the exact time of your talk and schedule a tweet with the DOI link to your slides soon after the beginning of your talk. In addition, it might be worthwhile scheduling tweets with some key take-home messages. And remember to figure out in advance the hashtag of the conference you will be attending and add the hashtag to all your tweets –that way all conference participants will be able to find your messages. Next, focus on arranging networking meetings. Have a detailed look at the programme. Which talks and sessions look particularly relevant to you and to your work? Who would you like to speak with? Reach out to these people and ask them to meet with you for a coffee, lunch, breakfast, or dinner. Not only you will have the chance to have dedicated one-to-one discussions with people of similar interests, but in addition, the people you approach will know their work is valued. With all this arranged, remember to also take some of your business cards with you. Might be a good idea to also leave out some of your business cards in the venue where you will be giving your talk so that people could pick them up and connect with you afterwards. Finally, before hitting the road set out your out-of-office message. It is a good idea to include information about the conference you are attending as well as adding a DOI link to your talk. In that way, people who email you will not only get to know that you are away at a conference, but will also have the opportunity to look at your presentation and learn more about your work. While the preparatory work for the conference is usually stretched over the period of several weeks, the work during the conference itself is limited to the actual time of the meeting, and thus tends to be very intense. During the conference try to make a good use of all the networking opportunities – try talking to various people and to speakers who inspired you. And, while it is sometimes hard, try to resist the temptation of hanging around with the people you already know well (or with your co-workers). While meeting new people, exchange business cards, and contact details – otherwise it is easy to forget all the new names. Make good use of Twitter at conferences. Lots of interesting discussions and debates now happen on Twitter. Follow the people who inspired you – that’s yet another way of keeping in touch for long after the conference. Finally, some people use Twitter for note-taking at conferences. They simply tweet all of their main observations and key messages of the talks they attend. One can even capture all (or selected tweets) and incorporate them into stories with the use of dedicated tools. If you are lucky and more colleagues from your team are attending the same meeting, use the opportunity to take notes collaboratively. With the use of Google docs, several people can be contributing to the same document simultaneously. Many conferences offer possibilities of more spontaneous focus group discussions, similar to Birds of a Feather sessions organised by the International Digital Curation Conference. If the conference that you are attending offers such opportunities, think about the recent problem you have been trying to solve and propose it for a public discussion. With a bit of luck, the topic you proposed might get selected and you might be lucky to get people brainstorming to find a solution to this problem. This sounds trivial, but while at conferences it is especially important to acknowledge people’s contributions. For example, by saying to someone that you liked their talk, or that they have facilitated a good discussion, or perhaps because you liked the questions they have asked the speakers. Or you might be grateful to people who provide you with feedback on your talk. In all of these situations it is always good to thank the contributors and to tell them you valued what they did. This encourages those who contribute to continue engaging. In addition, those who are new to the community will get the impression that comments and active participation are welcome. One important matter to realise is that our bodies need to physically cope with the intensity of a conference. So, while this might be difficult (if not impossible) with the amount of networking and with the necessity to catch up with some of the urgent matters at work, try to sleep well. If you have a chance to stay at a hotel close to the conference venue, it will offer you a couple of minutes of extra sleep. In addition, it is good to think about hydrating your body. While talking, interacting, drinking an endless amount of tea and coffee, one tends to forget about drinking water. So it might be a good idea to always ask for a glass of water alongside your tea or coffee. While this is of course entirely optional, try to bring back a treat to your colleagues at work. Be it a box of chocolates, or a local snack, it might be nice to share something with your fellow colleagues who were not able to attend the meeting. And so the conference is over. However, there is still some extra work to do after the end of the meeting, which will help you get even more out of it. As soon as possible after coming back from a meeting, reconnect with the people you have met. Add them on LinkedIn and/or send them personal email messages. It can be as simple as thanking them again for the nice chat you had, good talk they gave, or for the feedback they provided you with. This will remind them of you and will help you maintain the connection. If you agreed on something, follow up on your actions: send that paper you promised to send; connect the person with your colleague; make a note about the future project you discussed, etc. The important thing is to do it quickly and to keep the momentum going. If you have been offered any business cards, make notes on them. Add information about the occasion on which you have met the person and what you have spoken about. While this might seem silly to do, it might come in very handy in a year or two, when the memory fades and you want to reach out to someone from a certain organisation and you realise you have actually spoken to one of their representatives at a meeting. It might be also useful to share your lessons learnt with others. Be it an official presentation or a reporting meeting, or a less formal chat with your colleagues. In addition, it is a good idea to write a blog post with your key findings and observations. This will be useful not only to your colleagues, and to other people who were not able to attend the meeting, but also to the people who attended the meeting with you – they might find your notes and reflections inspiring. If you write a blog post and you mention some contributions specifically, it might be a good idea to let these people know that you acknowledged them in your writing – they will be surely happy to hear that and this will further help you keep the connection alive. Finally, if you are writing a blog post, let the conference organisers know – they might be interested in reposting it and in further publicising your work. Finally, reflect on what you did well and what could be improved next time. It might also be a good idea to speak about this to other colleagues who have experience of attending conferences and are effective at doing so – they might be willing to share good suggestions with you. This blog post is a work in progress. This list is surely not complete and the ideas and the checklist will evolve and change as new tools and new modes of engagement become available. Therefore, if you have any suggestions of what might be worth adding to this list, please add your comments below. I have been always very lucky to be surrounded by people who were very generous in sharing their good advice about active conference participation. I am therefore extremely grateful for all the good advice shared with me and which helped me write this blog post. I am particularly grateful to Dr Danny Kingsley and to Alastair Dunning, as their tips and tricks inspired the vast majority of this conference checklist. This blog post originally appeared under a different title on the Open Working blog and is published here with permission. Featured image credit: Conference by crystal710, via Pixabay (licensed under a CC0 1.0 license). Marta Teperek is the Data Stewardship Coordinator at TU Delft in the Netherlands. She previously worked at the University of Cambridge, leading the creation and development of its Research Data Management Facility, supporting researchers in good management and sharing of research data. While at Cambridge, Marta initiated and oversaw the Data Champions programme and the Open Research Pilot. Marta is a scientist by training; she completed a PhD in epigenetics at the University of Cambridge. She is an advocate for open research and better transparency in science, and tweets @martateperek. Hi, on my way home from a conference I came accross this blog and I wish I read it before I had gone! Very helpful. Thank you. This is quite an instrumental approach to conferences. A conference is not just about self-publicity or networking – it’s about learning about the latest developments in your field and making (or maintaining) friendships. (1) Select your conference very carefully. Ask colleagues about their experiences (though recognise that these are highly subjective). It can be worth varying the conferences you attend so that you meet new people and present to a different audience. Often small focussed events are a more effective use of time than lengthy conferences the majority of which will be of little benefit. (2) Given the impediments to conference participation are often time and money, it is always worth considering giving two papers if this is allowed. (3) Conferences are intense. I always miss one session (usually on the longest day or the session after my paper) to hide. This might be in my room or I might go for a walk. I try not to let anyone tag along! (4) I also always play a wild card and go to a session that does not relate to my research but just grabs my interest. This practice started when I went to the wrong room at a conference and ended up hearing three fascinating papers on prison history! (5) Speakers do want criticism, and it is part of the audience’s role to give it. But please think about how to present it. Occasionally I have witnessed nasty and unwarranted behaviour. Phrases like ‘I really enjoyed your argument about X, have you thought of considering Y’ make all the difference. Additionally having a chat over coffee about someone’s paper is less public. (6) Conference organisers never get thanked. And, if you are ever organising a conference, all of the complaints will be about the food and lack of car-parking!! I loved your Blog. Thanks a ton for your insights. This is very impressive and educational for me. My agency sponsor staff to conferences and workshops yearly and most staff come back empty. Maybe cos some of us (me included) have not been applying some of the things listed here, though I love to network alot. 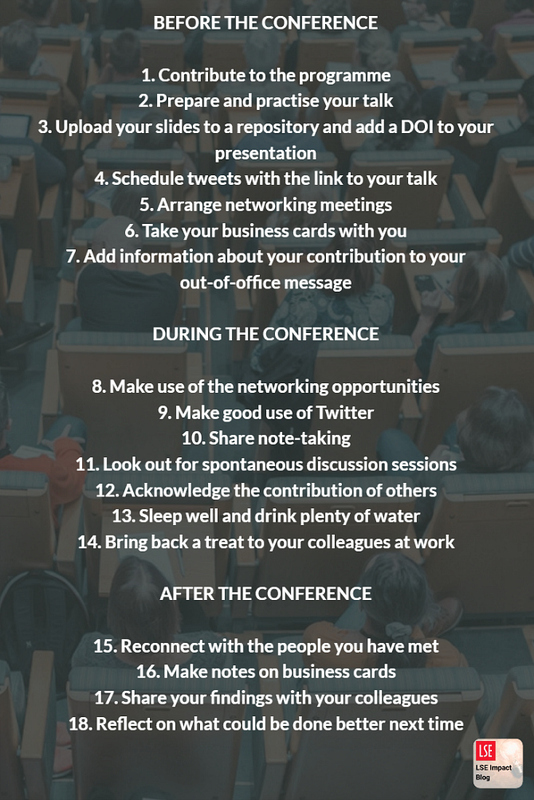 Anyway, with some of these tips I’m sure gonna do better in my next conference coming up this August. Thanks for sharing.